Eco-Schools (www.ecoschools.global) is the international award for sustainable schools. Eco-Schools aims at a structural sustainable change within the participating schools. The focus is on a positive change of behaviour (of students, staff, parents and others) and to secure the embedding of sustainability in the curriculum. The award is recognised by the United Nations and presented as an excellent educational example in the evaluation of the Decade of Education for Sustainable Development in Japan 2015. Within the Eco-Schools programme the approach is ‘student-led change’. The students are in the lead to make the difference. In seven steps the Eco-team will lead the school tot the award: The Green Flag. The Eco-team is in the driver seat of the process of becoming a sustainable school. The Eco-team consists of (at least) 10-15 students, 2-3 teachers, the concierge and one member of the management. This team can be broader by asking parents or companies to participate. The Eco-team will meet at least every month to discuss the progress. 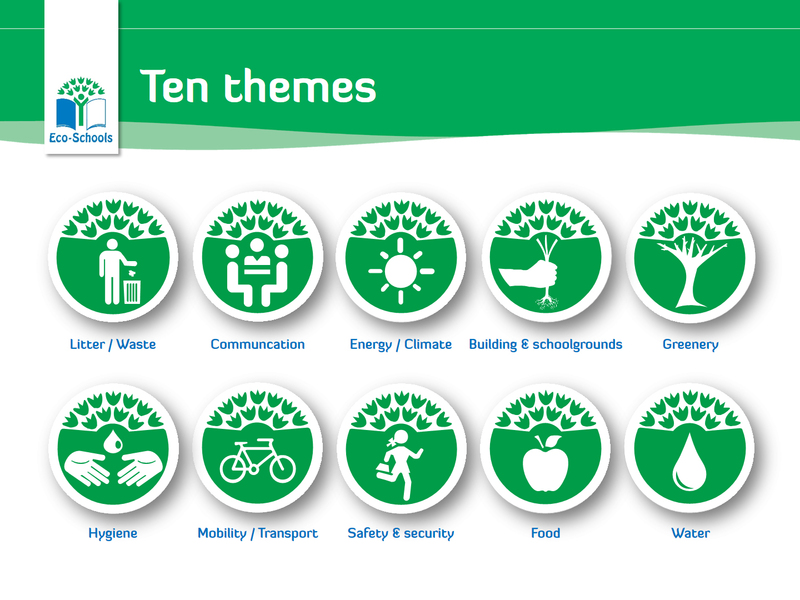 Based on the Environmental Review (step 2, also called the Eco-scan) the school and especially the Eco-team will choose the themes they will work on the following school year. The advice is to focus on two or three themes. After the themes have been chosen, the Action Plan will be made. Within the Action Plan the school and Eco-team present the issues they want to tackle, the goals on these issues (SMART formulated) and measures they want to take to reach these goals. The school can demand for the bronze certificate after step 4. So when there is an Eco-team, the Eco-scan is conducted, the Action Plan has been developed and measures are realised and monitored, the school can send in their information for the desk audit for Bronze. After step 5, the sustainability of the curriculum, the school can request the desk audit for Silver. To be eligible for a Green Flag certification, each school must complete the Seven Steps, keep track of all progress in the logbook and submit a portfolio of evidence. The final step is the Green Flag Assessment by an Eco-Schools auditor to see whether or not all requirements have been met. To reach the highest level of the Green Flag the international organisation of Eco-Schools international has ordered that an Assessment must be done by the national Eco-Schools organisation. A school must be re-accredited every two years. On February 3rd, 2016, the International Schools in the Netherlands gathered for a national Eco-Schools conference. Look at all the inspirational projects they shared with each other!